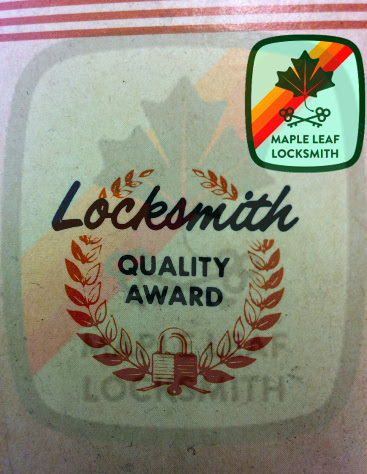 I am the Seattle locksmith you've been looking for. High Quality work at a reasonable price delivered in a timely fashion. Most people are familiar with the locks they encounter every day in their own home. These are typically entry function and passage function locks. There are many more functions available to you to suit your particular security needs. I stock the functions listed here in the most common finishes which are dull chrome, bright brass, and duranodic or oil rubbed bronze. I also stock some locks in less common finishes like aged bronze, satin nickel, bright chrome, etc. …are just to hold the door shut. They are advantageous mainly because you cannot lock yourself out with a passage lockset unless the lock breaks. 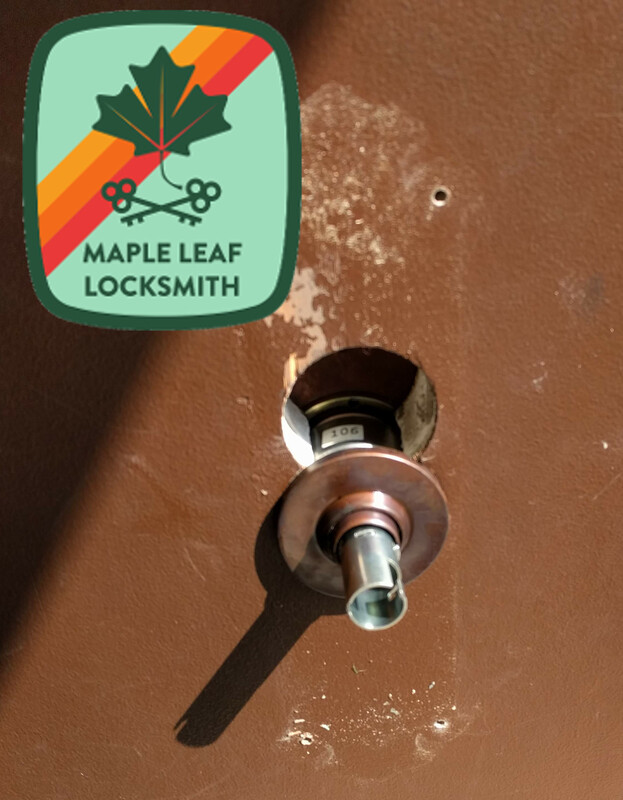 Entry locksets allow you to leave the door locked or unlocked. Some of these are very easy to lock yourself out with. Probably over 50% of lockouts I service are old Schlage F series entry knobs that don’t unlock when you turn the knob. You won’t notice the door is locked until you try the lock from the outside. Schlage updated their F series locks to automatically unlock when the lock is used to open the door from the inside, and this is the type I always install. Storeroom locksets are always locked from the outside. 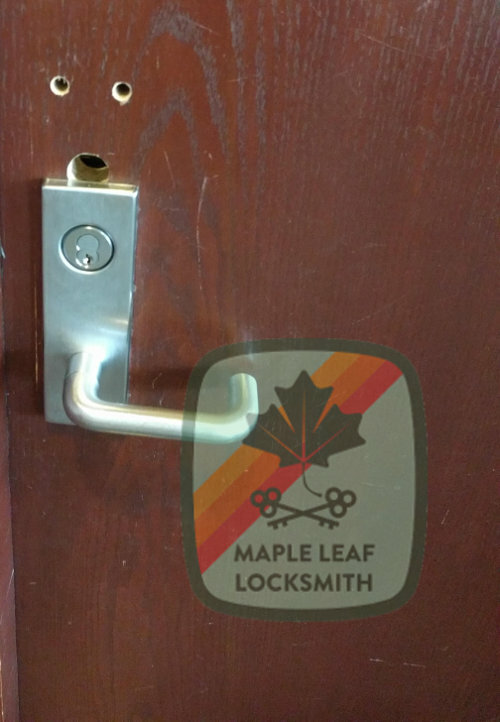 These are great for any door that people forget to lock like shared laundry rooms, front doors of apartment buildings, liquor or drug storage areas or, well, storerooms. 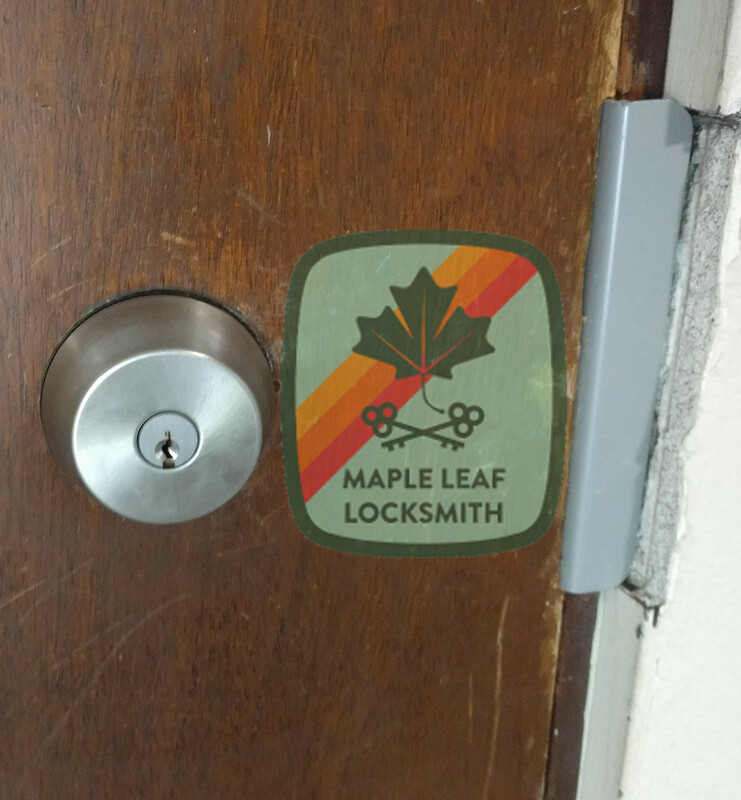 Employees can’t always be trusted to remember to lock the door. These guarantee that the door will be locked as long as somebody doesn’t prop the door open. For storeroom locks to work properly there should also be some sort of automatic door closer installed. Storeroom function locks are very easy to lock yourself out with. If you set the keys down inside a room that has one of these locks to pick something up and walk out in a hurry, you may be calling me. Other common uses for storeroom locks are bathrooms in city settings where there is a concern about vagrancy or drug use. The key is kept behind the counter where the staff can monitor who is using the bathroom. This setup may drastically reduce the number of needles and even corpses found in store bathrooms which as become an all too common problem in Seattle due to the rise in the homeless population along with opiate addictions. If there is only one key available to the public it also guarantees that nobody will be walked in on while in the bathroom. I install many of these in coffee shops, gas stations, department stores, etc. Frequently people will forget the bathroom key inside the bathroom so it is useful to have the bathroom lock masterkeyed, allowing the bathroom key to open the door as well as the entry key that the employees have. Classroom function locksets are not well known to the general public but can be very useful for certain applications. These can be left locked or unlocked but only with a key. There is no button or other device on the inside of the door for locking it, so people can always exit the space making it compliant with fire codes. I suggest their use for the front door of a shop or store. 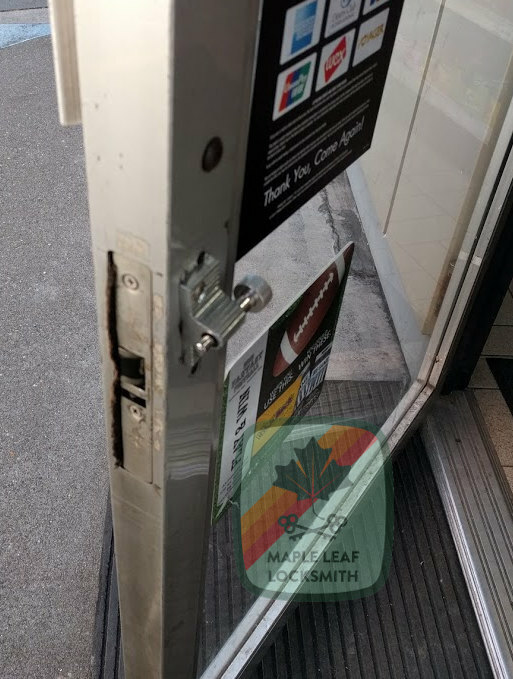 It won’t do to have a shop with an entry lockset because children or pranksters can lock the door on their way out and you may not notice the door is locked, meaning you lose customers and sales. 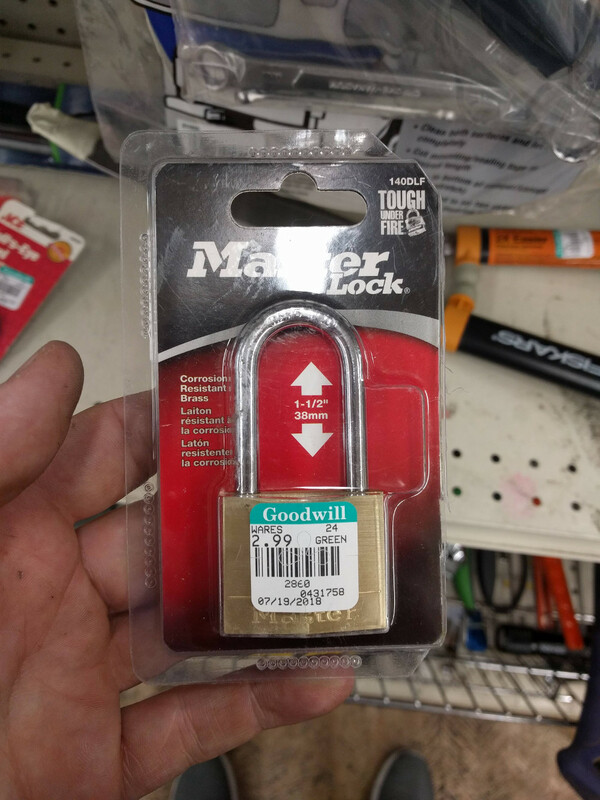 Some entry function locks are easy to accidentally lock. For example if the door opens far enough that the lock hits the wall, the lock button may get pushed in by the wall. The button might get pushed in by a clumsy person accidentally pushing it with their body. 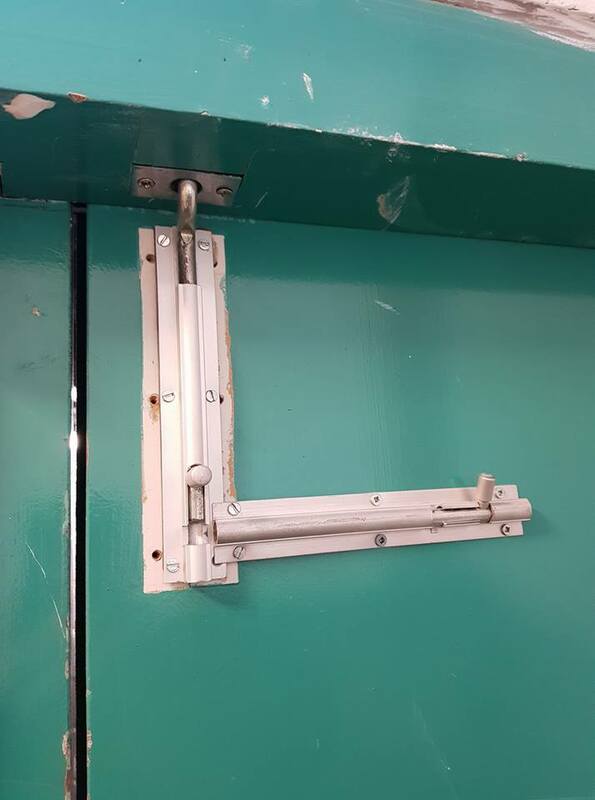 The classroom lock guarantees that only you can leave the door locked or unlocked. A good example of lockset functions is this list of Schlage ND Series locksets. Not all lock manufacturers make their locks in all functions, but Schlage AL and ND series locks are made in most of them. 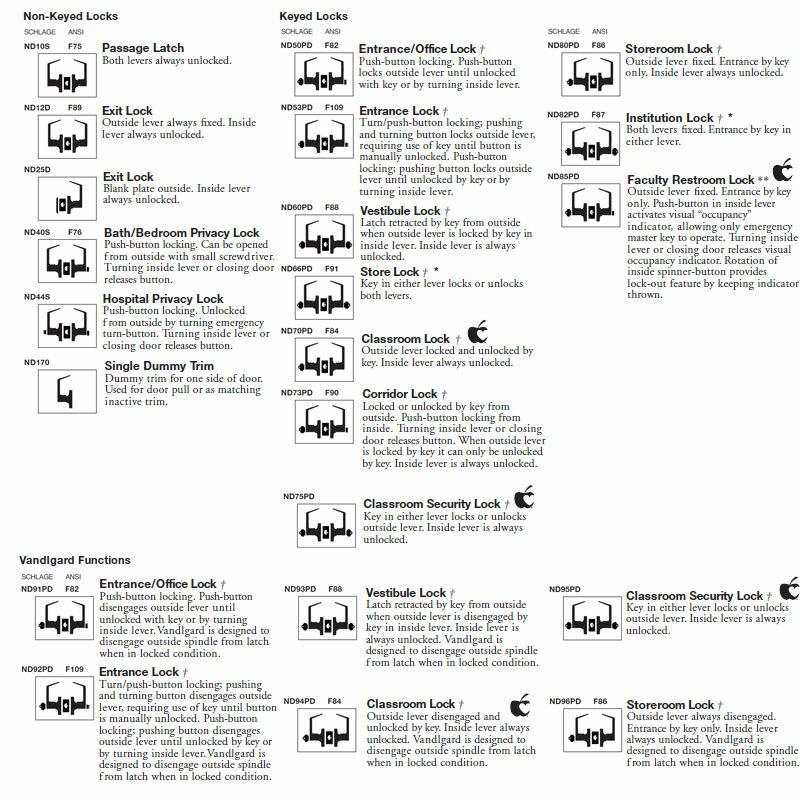 There are lots of different functions for locks aside from these as you can see from this helpful graphic. Some functions must be carefully considered before installation. Free egress is required for a space open to the public in case of fire or some other emergency, meaning you can’t lock people inside a room. Fire exits always require free egress when the public is allowed inside! This means that I won’t install an asylum lock that locks the door shut from both sides on a fire exit. People are always asking me to do this but it doesn’t make sense in most applications. Usually the only place I recommend installing these is on exterior gates. Even then customers frequently change their minds after the UPS man gets locked in their yard for example. This is a half-assed job. That thing is screwed into aluminum, a very soft metal. This would not stand up to a 200 Ibs gorilla yanking on the door. Posted on 2018/11/21 Author Bjørn MadsenCategories Blog, lolwut? This time of year I deal with a lot of heartbreak due to package theft. Many do their seasonal gift shopping online nowadays and all of their loot gets shipped to their doorstep or maybe the lobby of their building. In both cases packages will be targeted by thieves. To prevent your loot being intercepted I recommend shipping packages to your workplace. Otherwise, one can rent a mailbox where packages can be kept securely. Still, you are legally required to have some mail sent to your house and for those very important letters you will want a secure mailbox. For those in a multi-unit building such as condos or apartments it is prudent to have a designated mail room that is secured. Mail rooms are one of the top targets of criminals in these buildings along with bicycle rooms, laundry rooms with coin-op hardware, storage areas, and surveillance equipment areas. To keep these people out of your mailroom consider getting an astragal and or a gatelatch. You’re supposed to use a remodeler plate or wrap around plate to cover those holes up. Otherwise somebody could unlock the door with a hanger. Posted on 2018/09/15 Author Bjørn MadsenCategories Blog, lolwut? That’s not how you are supposed to do it. This guy didn’t know the backset is adjustable. Posted on 2018/08/26 2018/08/26 Author Bjørn MadsenCategories lolwut? Posted on 2018/08/26 Author Bjørn MadsenCategories Blog, lolwut? I get these all the time. Many of these problems could have been solved if people had just read the directions. Most locks come with installation directions and locks are designed to be much easier to install than they were 30 years ago. This was on the outside of an apartment building. You could reach through the hole in the door and unlock it if your hand is small. Posted on 2018/08/26 Author Bjørn MadsenCategories lolwut? Laundry machines are popular to break into in Seattle right now. At night nobody is around and there is probably more than $50 in quarters inside. Laundry rooms and mail rooms are popular to break into in Seattle right now. I get a few calls a week about this problem. At night nobody is around and there is probably more than $50 in quarters inside the machine’s coin box, making this an attractive target for people who need some quick cash for some heroin or meth. Typical communal laundry rooms in Seattle are secured with nothing more than a doorknob. Junkies have discovered that these doorknobs can be forced open with a pair of vice grips or a pipe wrench. This unfortunately works on even very expensive knobs, such as the Schlage D series which costs over $400. Sometimes the doors to these rooms are outside, making these rooms even more vulnerable. I can secure your laundry room door to make it much harder to get at your machine. 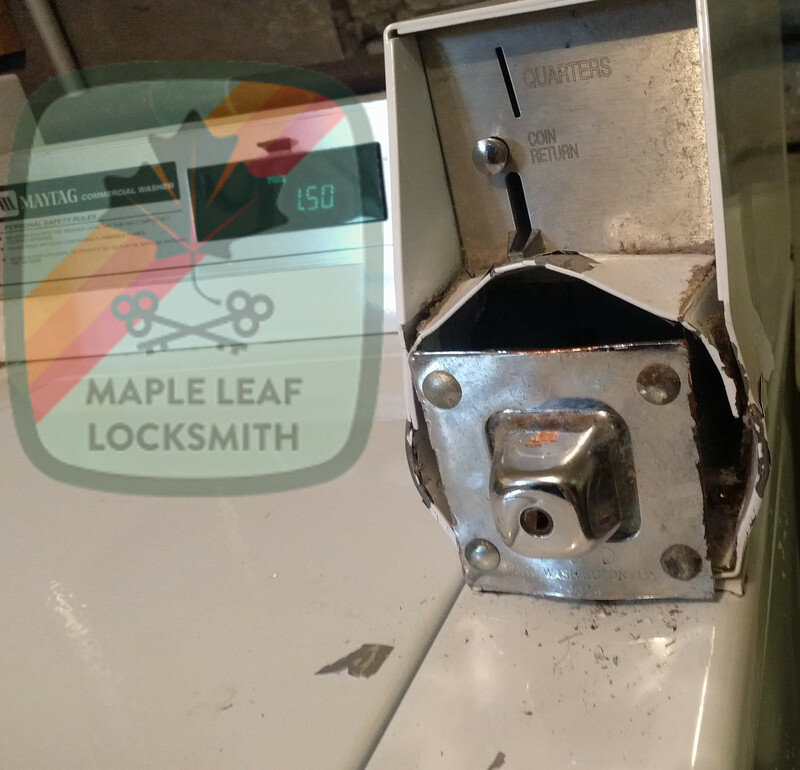 How do you prevent people from breaking into your laundry machine to steal quarters and creating an expensive mess? Secure the room from outsiders, then secure the machine from those who have keys (the 5th column). 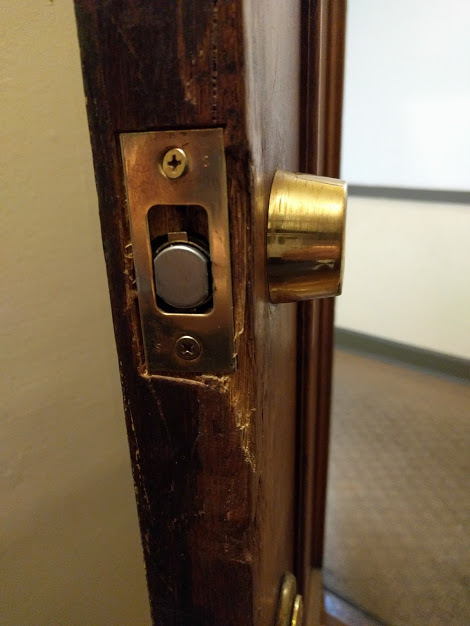 This lock looks like a deadbolt. It is very secure against attacks with wrenches and hammers. 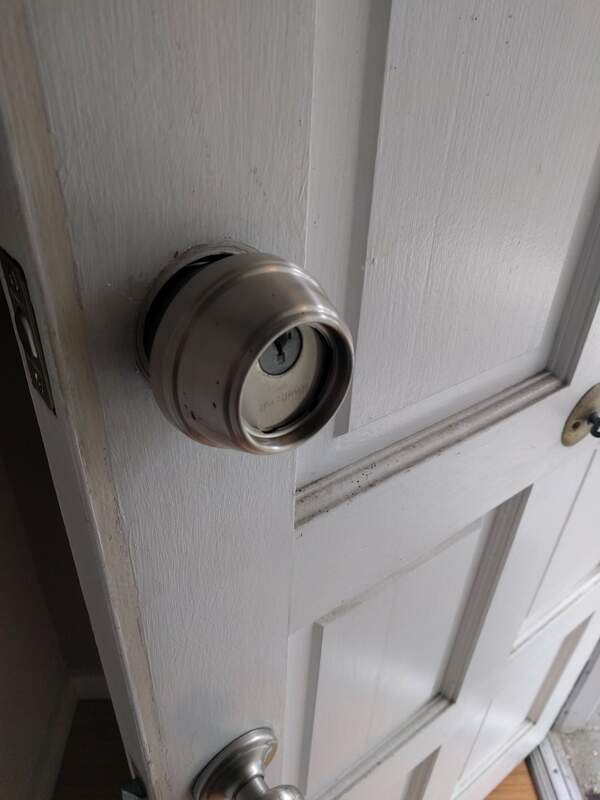 The best way in my opinion to do this is to replace the doorknob with a lock that is not vulnerable to attack with a wrench. This means either a panic bar and rim cylinder, a Marks nightlatch, or a knob or lever with a shroud. If you are getting break-ins and you already have a solid door that shuts properly then here is a plan to secure it. Some of these may not apply to your door. Read on for an explanation of why you may want these things. 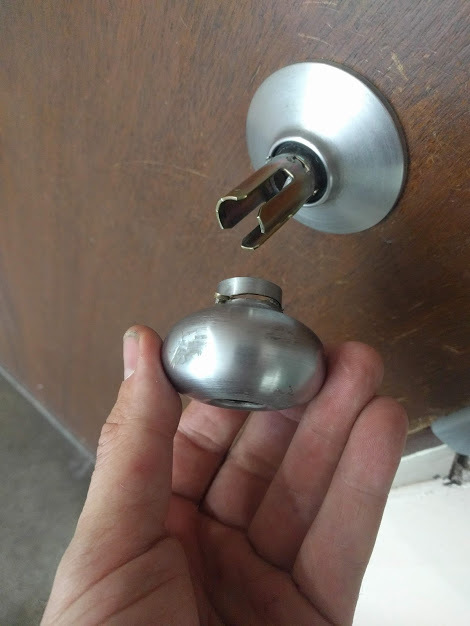 This is a doorknob that was wrenched off. This is a common method of breaking in to laundry rooms requiring nothing more than a $10 pair of vicegrips. Seattle is getting hit by a petty crime wave. As you might imagine from my job description my finger is on the pulse of petty theft and more generally the human condition in King County. Building owners are getting hit pretty hard in a few different places: garages, storage rooms, mail or package rooms, and laundry rooms. The thing that all of these places have in common is that, late at night, nobody is usually in or near them. Thieves of course are attracted to this and will break into cars, storage units, laundry machines or whatever and will have hours to do it between the hours of 3 and 6 am. Key control (whether or not criminals have access to the key). The lock on the door. The strike on the door frame. Whether or not the door is getting shut automatically and the lock is actually engaging. Whether or not the lock is protected by direct manipulation such as prying, wrenching, hammering, etc. I can fix all of these things except replacing the door, though I can do a lot to reinforce a door and door frame. A properly installed door is crucial to building security. If the gap between the door and frame is too great, it is easy to pry open without the addition of an astragal. No matter how secure your door is it won’t help if thieves get a key. Get a restricted keyway and audit who has how many keys. If they lose the key, for the best security rekey the locks the key worked on. That is expensive, so put it in the lease agreement that they have to pay for this if they lose the key. Addressing the question of locks, there are a few requirements for buildings open to the public and multi unit residential buildings. Designated exits have to have either a lever or a panic bar, depending on the maximum occupancy of the room near the exit. Unfortunately, this excludes the use of deadbolts. 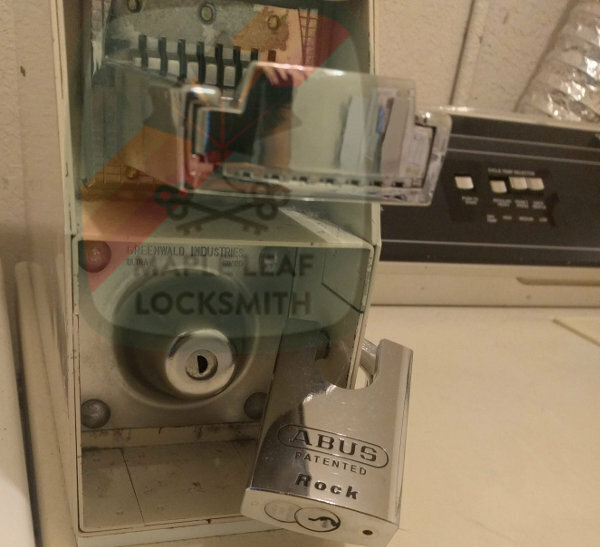 Deadbolts are also a poor choice because they require that you trust your residents and tenants to turn around and lock the door when they are leaving the room or building. As any property owner will tell you, they just can’t be trusted to secure the building. To properly secure your building, you have to make the doors stupid-proof. This means the doors must automatically close, and they must automatically lock when they close. This means our choices are limited to levers, panic bars, and special hybrid locks like gate latches. 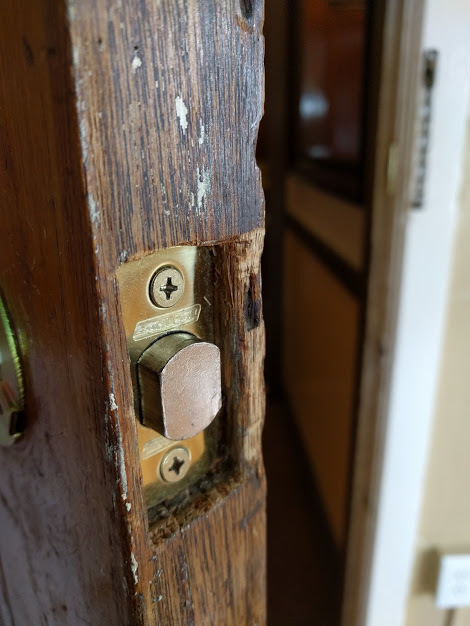 For the lock to work correctly, the door first has to be shut. This is most often done with the help of an automatic door closer. It will shut the door slowly but firmly without slamming. This ensures that as long as nobody puts something in the way of the door it will shut until the lock engages in the door frame. For the lock to engage, a strike plate must be installed in the door frame correctly. If it is installed wrong the door might not latch shut, leaving it unlocked, or the deadlatch might not engage, meaning somebody might open the door with a credit card or a butter knife. We can mitigate this weakness by either moving the strike plate, grinding the strike plate, or installing a latch protector or an astragal. One limitation of many of the doors on a modern multi unit building is that the doors will be fire doors, meaning that we can’t legally move strike plates or grind strikes. Adding or modifying hardware on these doors invalidates their fire rating. Any hardware that is added to such a door must be approved by the entity that issued the fire rating. If you want hardware installed on a fire door I will not do so unless you accept the full responsibility for the fire door and its UL rating. If you’re still with me, here is the part where we get to solutions: how to keep criminals out with the perfect door. 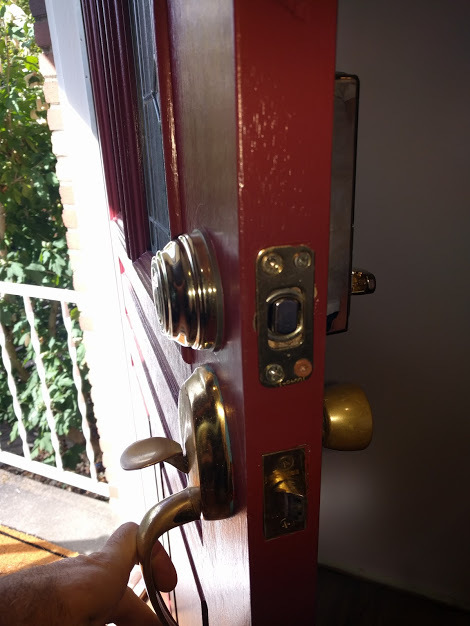 If you already have a correctly installed door, we need a door closer, a deadlatching lock with no knob or lever on the outside, and maybe a latch protector or astragal covering the gap between the door and door frame blocking direct manipulation of the lock’s deadlatch. 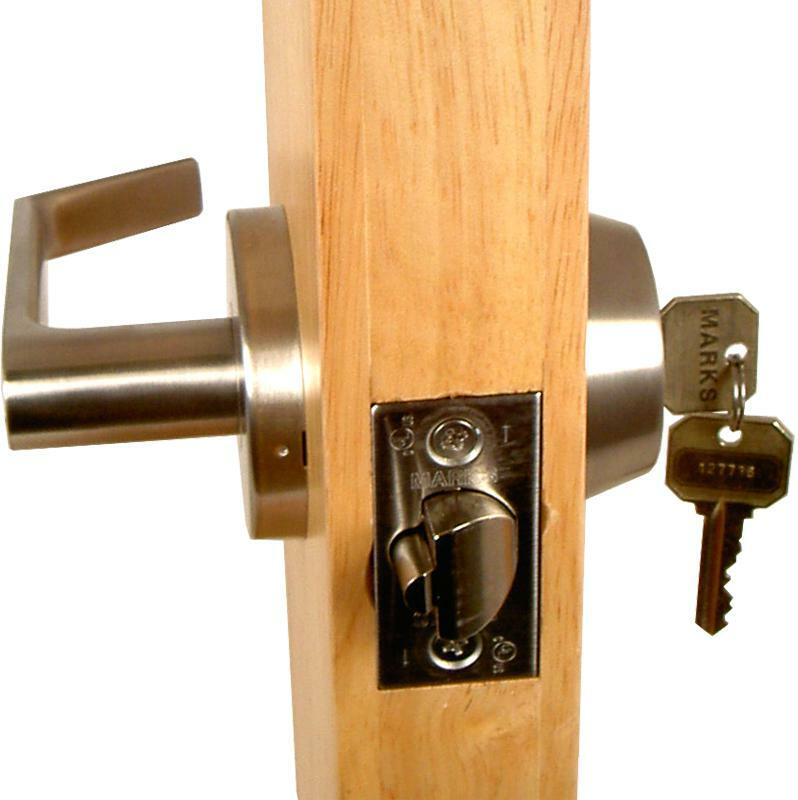 The best locks for this purpose on a standard wood or hollow metal door are a panic bar and lock cylinder mounted flush to the surface of the door for exits of rooms rated for occupancy of 50 people or above, or the Marks gate latch with a lever on the inside and what appears to be a deadbolt on the outside. This lock is much more resilient to efforts of forced entry. A pipe wrench won’t force this lock open. Neither will a pipe or brute strength. Even a hammer won’t force this open, unlike levers and doorknobs. These locks are still ADA compatible and meet fire safety rules for rooms rated less than 50 occupancy. The Marks 145 gate lock is ADA compatible but still highly secure from the outside. The tapered collar makes it difficult to get a grip on it even with a pipe wrench or vice grips. Lockouts are maybe my favorite part of my job. Everybody is very thankful when you unlock their door. They are often the most comical part of my job, too. 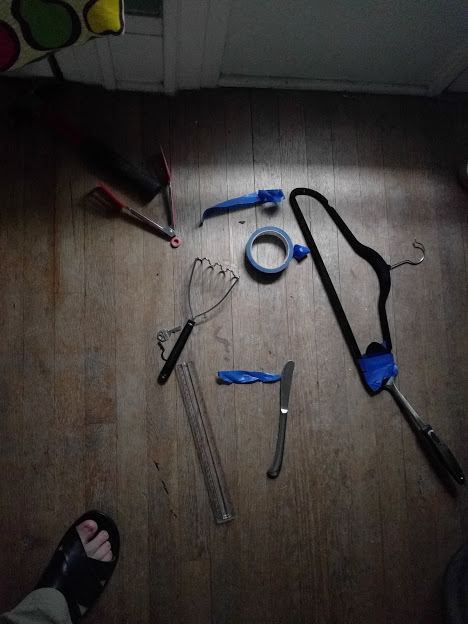 I’ve started collecting pictures of the implements scattered outside of people’s doors when they have given up and called me out. Here are a few of those pictures. Improvised lockpicking tools. Lock manipulation using these tools was unsuccessful. First, this person fashioned a tool out of a hanger taped to a serving spoon. I was told that the potato masher wouldn’t fit under the door so was not included in this contraption. 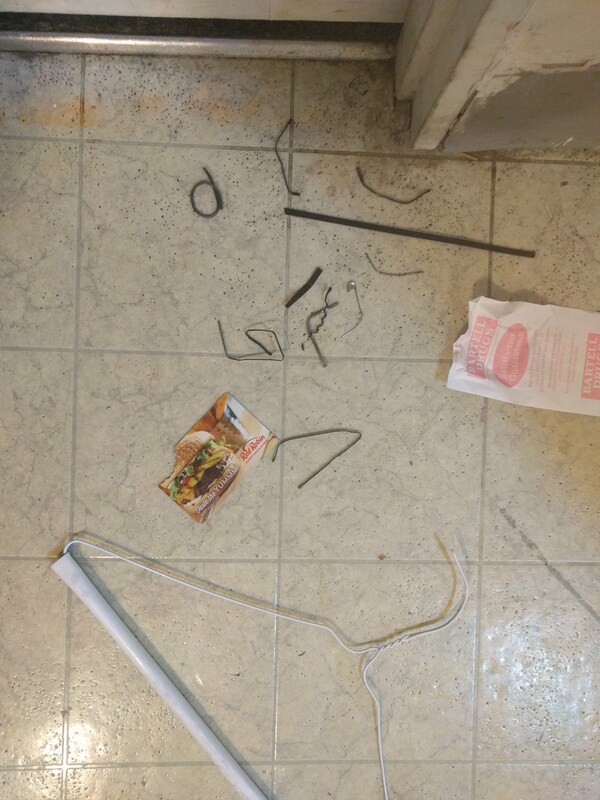 The customer reported that these tools were all fashioned with the intention of moving a backpack containing room keys closer to the door and trying to get the keys out. and easy to pick, but even with hours of attempts with these tools successful manipulation evaded these hapless Greeks. Members of collegiate fraternal organizations at my alma mater, WSU, would no doubt have kicked the door in or broken the doorknob off with a hammer. If these differing approaches are extrapolated as life-guiding philosophies, which do you think will lead to more success? Regardless of the answer, I hope that people will continue to choose me in their time of need. Posted on 2018/04/28 2018/04/28 Author Bjørn MadsenCategories Blog, lolwut?